Shapur I (ca. 215-272) - Ardashir I was succeeded by his son, Shapur I. He would later become known as Shapur the Great because he likely was the greatest of all Sāssānid kings. His reign lasted 30 years from 242 to 272. Before that, he was co-regent with his father for two years and accompanied him on his military campaigns. Ardashir spent several years securing his position as the ruler of the new Persian dynasty, and his son gained valuable military experience as a result. After the last remnants of the Parthian Empire had been defeated, Ardashir began focusing on his predecesor's old enemy, the Roman Empire. But he did not live long enough to do much. 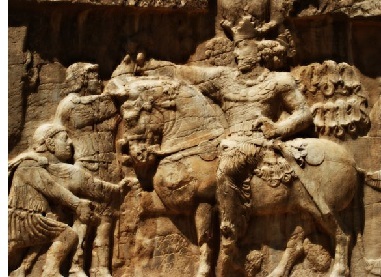 Shapur, on the other hand, devoted much of his reign to fighting the Romans. Very early in his rule, he captured the Roman strongholds of Nisibis and Carrhae (the same Carrhae that Crassus attacked three centuries earlier. See Battle of Carrhae). Then he crossed the Euphrates and invaded Syria, taking Antioch. The Roman emperor, Gordian III, responded by landing an army in Syria in 242 and driving Shapur back. He re-captured all the territory the Sāssānids had taken and pushed them all the way back to their original land. Gordian could have stopped there and concluded a successful campaign, but he chose instead to invade eastern Mesopotamia and try to extend Roman territory. It was a fatal mistake. The Sāssānids defeated the Romans on their home turf and Gordian was killed in battle. His successor, Philip, had no stomach for further war and made peace with Shapur in 244. However, six years later, Shapur renewed the war and invaded western Mesopotamia (Mesopotamia was the front line Roman-Sāssānid wars). He caught the Roman army (about 60,000 soldiers) by surprise and annihilated it at the Battle of Barbalissos. This battle is only known from Shapur's rock inscription, Naqš-e Rostam, so its verification is impossible to determine. He once again penetrated into Syria and conquered Armenia. Similar to Gordian III, the emperor at that time, Valerian, brought an army east in 257 and attacked the Sāssānids. Once again, the Romans drove them out of Syria and recovered their former territory. Once again, they pursued their opponent into Sāssānid land; and once again they were defeated at the Battle of Edessa, after over-extending their forces. But Valerian wasn't killed as Gordian had been (at least not immediately). His ultimate fate is uncertain. The Naqš-e Rostam depicts Shapur exercising authority over Valerian, and Valerian kneeling before him pleading for mercy. Whether or not Shapur granted it is not known. There is a Christian writer named, Lactantius, who claims Shapur humiliated Valerian by using him as a footstool every time he mounted his horse, before flaying him and having him stuffed as a trophy. However, as a Roman, Lactantius was perhaps biased against the Persians. Sāssānid sources are more sketchy, but may indicate that Shapur afforded Valerian the respect of a fellow ruler and allowed him and his men who survived to settle down in Persia and live out a decent life. Perhaps the truth is something in between the two. What is known is that his days as emperor were over and he never returned to Rome. As for Shapur the Great, he died in 272 and was succeeded by his son, Hormizd.